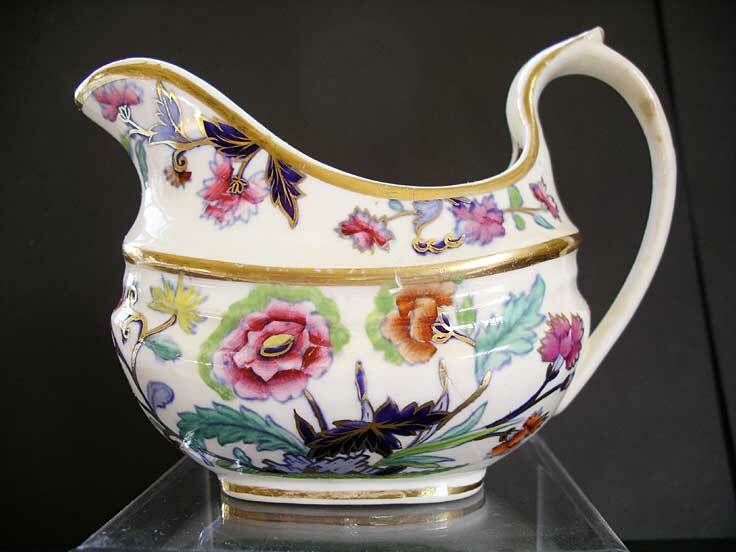 "A striking English porcelain cream jug by Charles Bourne - brightly decorated oblong shape with distinctive high rounded handle, including pronounced thumb rest. These fine Regency Charles Bourne porcelains are rare and were only made between c.1817 and 1830 at the Foley Potteries Fenton Staffordshire. A great antique for the serious collector and a super cabinet display item." Antiques Expert Hamilton Bear. References: See A Cabinet of British Creamers, Michael Berthoud page 112 colour plates 667 and 668. 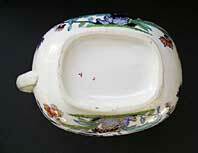 Also Staffordshire Porcelain Geoffrey Godden Ed. plates 358 & 359 pp. 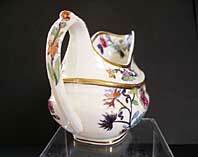 240-241 for further examples of fine Charles Bourne porcelain cream jugs in this shape. Dimensions: height 100 mm max. width 140 mm max. Condition: Very good display condition. Decoration is good with no significant wear. No restoration. Traces of age/use related light browning to handle. Hairline crack extends down side of jug - difficult to spot as 'hidden' by the pattern but visible to inside. Piece is stable.